A block of two terraced houses built to a modular design, enabling more kits to be added to create whole streets. 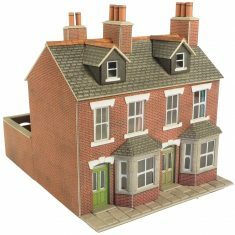 The kit comes with self adhesive individual paving slabs (that match our PO210 Paving packs) giving a truly realistic touch to the house fronts. The back yards are equally impressive too. This is a beautifilly intricate looking kit, yet easy to build. Matches up with PO263 Corner Shop Kit. The best eCommerce software by ShopFactory powers P1121. All-in one eCommerce and shopping cart software.